Sometimes, I think to myself in French too. Such a sweet, sweet nursery. I like her name too. Martha is coming to Canada!!! I'd like a pony ride at my birthday too, please. Zara Home opened its first store in North America this week - it was the most beautifully merchandised space. Here's what I saw in store. I made this big announcement over on BlogPodium's blog. Eeeek! I love her. A cute way to celebrate Back To School. 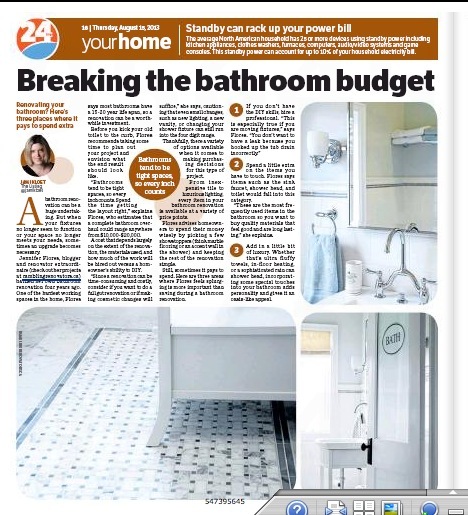 Our bathroom got a little feature in 24Hours newspaper (Thanks Jami!). You can read it online here, click August 15 on the calendar, page 16. I'm crushing on gold foil lately.